I’ll admit, that on walking into Mongolian BBQ, located on 700 El Camino Real, my first impression was pretty bleak. There was no decoration beyond its blank white walls and a featureless gray carpet in the vast, open room. It was definitely one of the less inviting restaurants we’ve ever reviewed; the room was bare aside from the cash register, tables, and the counter itself. The counter was bracketed by glass panels with each type of meat labeled on it: beef, chicken, pork, and lamb (only available on weekends or dinner). There was also a tray of egg noodles and a healthy helping of sides: pineapples, carrots, tofu, and plenty more. The sauce selection was just as comprehensive, with the options of about, ranging from oyster and cooking wine, to garlic, and hot sauce. Combined with other options like teriyaki and sriracha, just about anyone should be able to find a sauce selection that fits them — though I’ll say, their “recommended” sauce recipe adds a scoop of just about every sauce on their bar, leading to more of a soupy mess than an actual bowl of meat. The all-you-can-eat style meant that I could get as many different types of meat as often as I want and with my fear of picking poorly assuaged I heaped up a bowl of lamb and a bowl of noodles, topped with pineapples and garlic sauce, and waited for my order to cook. Following Jasper’s lead, I grabbed two bowls and began making my way down the buffet line, piling just about everything offered up on the array of trays into my bowls with some minor complications, specifically regarding the trail of rogue, escaped bean sprouts and carrot slices that lay strewn about in my wake. I threw a bit of every meat onto the bed of egg noodles settled on the bottom of my bowl, but primarily beef, lamb, and pork. That was followed by a couple heaping helpfuls of carrots, bean sprouts, and cilantro. I followed a recommended sauce recipe for Mongolian Beef, which is actually one of my favorite foods, and dumped nearly a ladle-full of each oil onto my food, resulting in an attractive concoction that was more a stew than a solid. I slid my bowls across the counter and the cook snatched them up, deftly and quickly swirling the sizzling mess of meats around the circumference of the giant griddle in a hypnotic flurry of sharp crackles and vibrant colors. Within a couple of minutes, everything was cooked up and the smell alone was enough to make my mouth water; I vigorously grabbed my bowl and headed over to our table after making a quick stop to squirt a few drops of sesame oil and sriracha on my food, of course (I can’t help putting sriracha on everything I eat). I made short work of my bowl, hunting down every morsel that remained until it was so clean I could see my reflection. Sufficed to say, the food was delicious. It tasted just like the Mongolian beef I love so much, plus the fact that I could pretend I made it myself even though I did literally no work made it all the better. The lamb and beef were chewy and seeping with flavor, but the pork was easily my favorite (I am Jewish but let’s just ignore that inconvenient truth for the sake of discussion). It was notably more tender than the two former meats, and in my personal opinion soaked up the most of the aromatic, savory bath of oils and sauces I had bathed it in prior. The vegetables, particularly the carrots, also underwent a major upgrade in flavor from the sauce mixture, as one would expect to happen when you add about 800 calories of oils onto “healthy” bland foods. For the sake of getting my money’s worth I returned for a second bowl, this time opting to pass up the noodles as to not shoulder the risk of my stomach imploding. Not one for variety, I decided to create what was essentially the same thing I made before, so I won’t go into it. That said, I can guarantee it was as delicious as the first bowl, albeit a little difficult to eat giving the rapidly shrinking amount of available real estate in my abdomen. The cook, standing in front of a massive, heated cooking table, wielded two wooden sticks with consummate skill, flipping and grilling the meat and noodles marinated in my sauces of choice. From his bored expression, what looked incredibly impressive to me was casual and an everyday occurrence for him — I suppose I shouldn’t be surprised, considering it was his job. In a couple of minutes he had finished grilling, dumping my meal into a new bowl and moving to the next customer in line. I brought my bowl back to my table, added some egg rolls, orange chicken, and some sesame bread to my dish, and dug in. The lamb was great — not too tough or chewy, but marinated with just enough garlic and possibly too much sauce (I drizzled about a quarter-pound of teriyaki sauce on top, because I love teriyaki sauce). The egg rolls were decent as well, though nothing particularly notable. The sesame bread was not quite up to par with the rest of my meal; it was bland and tough, without any taste but quite a lot of texture. Considering that it is an all-you-can-eat buffet, you can definitely eat your fill without ever touching the bread, so I’m willing to give them a break on that one. My second time around, I eschewed the noodles in favor of two dense bowls of meat, one of pork and one of beef. I mixed up my sauces as well, going for their aforementioned “recommended recipe” that resulted in liquid spilling almost over the sides as I handed them to the chef. I will admit that it tasted very good, and the combination of sauces, alongside their sheer quantity, imparted far more taste than my earlier two scoops of garlic sauce. But the seeming gallons of sauce that sizzled away led to a feeling of wasteful guilt that almost (but not quite) outweighed my tastebuds. I finished my meal with a bowl of their soft serve vanilla ice cream, and left satisfied and more than full. All in all, I think both Jasper and I stood in firm agreement in regards to our opinion of Mongolian BBQ. In addition to the food being delicious and the comfortable atmosphere, the do-it-yourself aspect of the entire eating experience put a fun spin on the affair, with an added bonus of letting us experiment and go outside our comfort zones with different ingredients and toppings. The restaurant is pricey, with a meal running about $17 per person if you include the tip, however if you go in ambitiously with an empty stomach it’s easy to get an amazing meal as well as a full money’s worth. Although Mongolian BBQ was wonderful and particularly unique, it lacked a certain spark, or heart if you will, that would push it over the edge to the Bear Bites Hall of Fame (ie. 5/5 stars), therefore Jasper and I agreed to award it a respectable 4.5/5 stars. 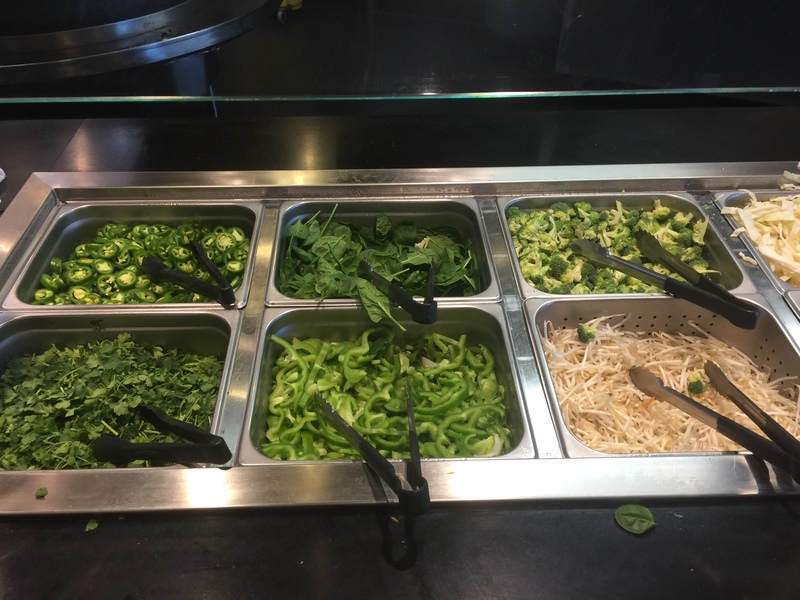 For anyone looking for a large, limitless, and luscious meal, well catered to dining with friends or family, look no further than Mongolian BBQ. My name is Ben Strehlow and I am a new addition to the M-A Chronicle team. I want to try my hand at writing features and reviewing local food at restaurants in the Bay Area with my friend and colleague Jasper Fu. In journalism, I want to work on my creative writing skills and work towards developing more powerful and evocative writing. Outside of the classroom I love to play the violin and viola and I consistently teach lessons to a wide variety of students. When I have free time, I love to bake different types of foods and desserts and watch movies with my friends.